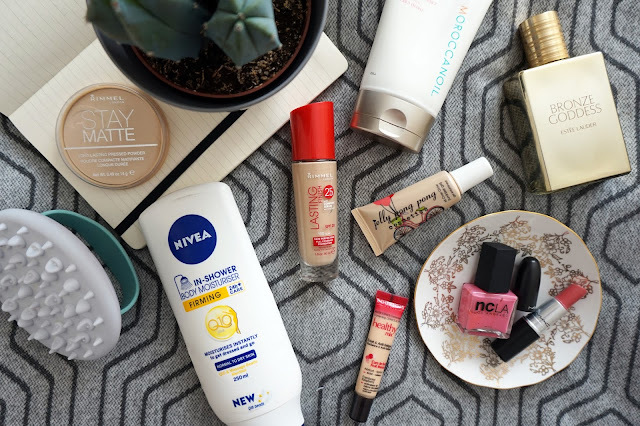 So tomorrow I am jetting off for some sun, sea and sand, but couldn’t go without squeezing in my beauty favourites post for the month of June! Over the past month or so there have been quite a few new discoveries of products that I don’t think I could go without now, as well as a few rediscoveries in the world of make up. Moroccan Oil Hand Cream* – Moroccan Oil can do no wrong in my eyes, but I’ve only ever dabbled with their hair products, so when this hand cream landed on my door step I was both intrigued and excited. The wonderful scent of this is so lovely, and the cream is the perfect consistency; light and not at all sticky, leaving my hands feeling nourished and super soft! Estee Lauder Bronze Goddess – One of my good friends introduced me to this summery scent soon after it relaunched for the season. I’d heard of it before, but never smelt it as I’d always seen Estee Lauder as a more mature brand and hadn’t thought I’d find any of their perfumes to be something I would like. One sniff of this beauty though and I was hooked! If you’ve never tried this before, then get your skates and give it a go, as it won’t be around for long. It’s the perfect summer scent, with the main note being coconut for a fruity, light feel. I’ve worn this every day and had so many compliments, my favourite being ‘You smell like holidays’ which pretty much sums up this fragrance to a T! 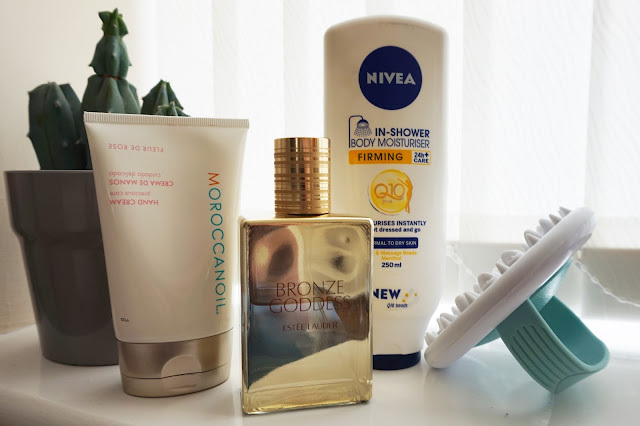 Nivea In-Shower Firming Body Moisturiser – I raved about this range in my last favourites post, so apologies if this sounds like I’m repeating myself, but I really wanted to give this in-shower moisturiser a mention. This creamy shower lotion is packed with exfoliating beads that have kept my skin feeling so soft lately. I love the fresh scent and how I don’t need to use moisturiser after showering, as this does the job for me! I’ve definitely seen a difference in the firmness of my skin, but I have been using a few products from this range on a daily basis, so I can’t be sure whether this product in particular is responsible for that, but on the whole I think this is a great product. Champneys Cellulite Body Massager – Alongside my In-Shower Moisturiser, I’ve loved using this body massager to really work the product in and to improve the appearance of my skin, particularly on my thighs. I’ve used this more a good couple of months now every time I have a bath or shower and again, have noticed a difference, however I can’t say for sure if it’s because of this or the other things I’ve been using. I’ll still be sticking to this though as I think it’s definitely played a part in that! Rimmel Stay Matte Translucent Powder – An oldie but a goodie, this is hands down my favourite drug store setting powder and the one I reach for when my MAC Mineralize Skin Finish Natural powder runs out. It’s so ridiculously affordable and really makes a difference to my make up when I add a dusting of this over my T Zone. I love how it’s available in this translucent shade, as it means it isn’t adding any colour to my face, and instead is there to solely just keep everything in place and making sure shine is at bay. Mac Lipstick in ‘Fanfare‘ – I recently rediscovered this shade sitting at the back of my lipstick drawer and decided to bring it back out and make an effort to use it again, as it was always one of my favourites last year. Needless to say I am once again hooked on this pretty pink ‘your lips but better’ shade. It’s a lovely natural colour that’s so easy to wear, and looks great worn for day or night as it goes beautifully with so many different make up looks. 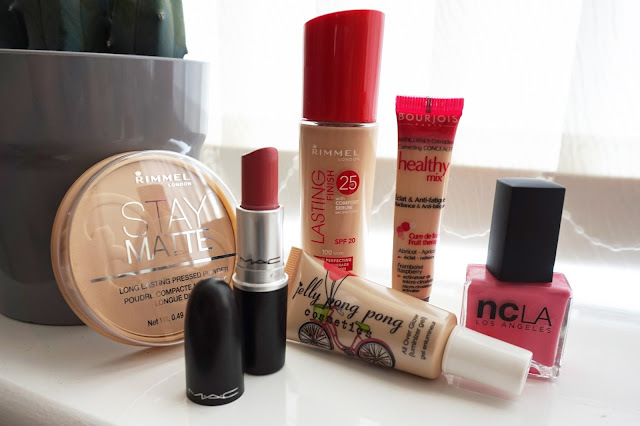 Rimmel Lasting Finish 25 Hour Foundation – A new discovery for me in the world of foundations, and one I have fast fallen in love with. This foundation stays put on my face the entire day, doesn’t go patchy or disappear off my skin like others do after time, and has even stayed in place during the current heatwave. I wouldn’t be able to vouch for the ’25 hour’ claim, as I think thats a) a little bit ridiculous and b) why would anyone want their foundation to last 25 hours? However it does have some serious staying power. My only bug bear with this, is that it feels very sticky when first applied, but that sensation does go after the product has settled. Jelly Pong Pong All Over Glow – This is something I got in a Glossy Box a while back, but it got pushed to the back of my drawer and forgotten about until a few weeks back. I’ve been dotting a small amount of this gel highlighter across my cheek bones for a subtle glow, and I absolutely love it. It’s just the right tone for my skin colour, and leaves the most beautiful, natural sheen to my cheeks. The fact that it’s a gel consistency means it’s easy to apply and blend with my fingers. Love! Bourjois Healthy Mix Concealer – Another product I’ve used time and time again, and recently rediscovered when I needed to pick up a new concealer but my local Boots was all out of Maybelline Instant Eye Eraser. I spotted this one in stock and knew I loved it having used it before, so decided to pick one up in the meantime. I’ve used it every day since, and can remember exactly why I loved it so much. It’s a great consistency that’s really easy to work with, and it really brightens my under eye area up. NCLA Nail Polish in ‘Like…Totally Valley Girl’ – This was another Glossybox product that I failed to use, but recently found when looking for a pretty pink to paint my nails with in between shellac manicures. I found this one and gave it a go, and have used it many times since. It’s the perfect mid-pink, which looks lovely against my pale skin tone and lasted a good few days before chipping! Winner. So those are the items I’ve been loving throughout June. I’m off on my holidays tomorrow so I won’t be around all that much on here. I will be scheduling a few posts to go live whilst I’m away so do keep an eye out for those! No doubt my July favourites post will be packed with holiday essentials! "TOP TIPS FOR SUMMER HOLIDAY PACKING"